Roald Smeets – Trappist beer is brewed by Trappist monks. Eight Trappist monasteries–six in Belgium, one in the Netherlands, and one in Austria–produce beer. The Trappist order originated in the Cistercian monastery of La Trappe, France. Various Cistercian congregations existed for many years, and by 1664 the Abbot of La Trappe felt that the Cistercians were becoming too liberal. He introduced strict new rules in the abbey and the Strict Observance was born. Since this time, many of the rules have been relaxed. However, a fundamental tenet, that monasteries should be self-supporting, is still maintained by these groups. Monastery brewhouses, from different religious orders, have existed across Europe since the Middle Ages. From the very beginning, beer was brewed in French cistercian monasteries following the Strict Observance. For example, the monastery of La Trappe in Soligny already had its own brewery in 1685. Breweries were later introduced in monasteries of other countries as the trappist order spread from France into the rest of Europe. The Trappists, like many other religious people, originally brewed beer to feed the community, in a perspective of self-sufficiency. Nowadays, Trappist breweries also brew beer to fund their works and for good causes. Many of the Trappist monasteries and breweries were destroyed during the French Revolution and the World Wars. Among the monastic breweries, the Trappists were certainly the most active brewers. In the last 300 years, there were at least nine Trappist breweries in France, six in Belgium, two in the Netherlands, one in Germany, one in Austria, one in Bosnia and possibly other countries. Today, eight Trappist breweries are active–6 in Belgium, 1 in the Netherlands, and 1 in Austria. 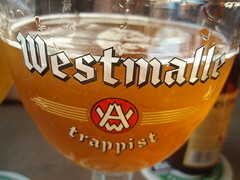 In the twentieth century, the growing popularity of Trappist beers led some brewers with no connection to the order to label their beers “Trappist”. After unsuccessful trials, monks finally sued one such brewer in 1962 in Ghent, Belgium. This association has a legal standing, and its logo gives the consumer some information and guarantees about the product. As of February 2012, the trappist brewery of the abbey of Engelszell, Trappistenbrauerei Engelszell in Engelhartszell, Austria, is active and has started brewing beer at the monastery (the former production had stopped in 1929). The monks claim that their next challenge will be to obtain the logo, hopefully before the end of 2012. The Dutch brewery De Koningshoeven produces the only Dutch Trappist beers – branded La Trappe – that are able to carry the “Authentic Trappist Product” logo. Their use of the logo was withdrawn in 1999, but was restored in October 2005 (see Brouwerij de Koningshoeven for details). In 2012, an 8th brewery in Austria has started production. The French abbey of Sainte Marie du Mont des Cats has been selling Trappist beer since June 16, 2011. This abbey has no brewery at this time and does not plan to build one in the near future, for reasons of cost and brewing skills. They have not excluded rebuilding one brewery in the future. The Trappist beer sold by Mont des Cats is produced by the Chimay brewery and does not wear the “authentic trappist product” logo. , Netherlands are planning an on-site brewery. Produced by a non-Trappist monastery—e.g. Cistercian, Benedictine; or produced by a commercial brewery under an arrangement with an extant monastery; or branded with the name of a defunct or fictitious abbey by a commercial brewer; or given a vaguely monastic branding, without mentioning a specific monastery, by a commercial brewer. With the recent exception of Koningshoeven’s Bockbier, Trappist beers are all top fermented and mainly bottle conditioned. Trappist breweries use various systems of nomenclature for the different beers produced which relate to their relative strength. The best known is the system where different beers are called Enkel/Single, Dubbel/Double and Tripel/Triple. Considering the importance of the Holy Trinity in the church, it is unlikely that the choice of three types of beers was accidental. Enkels are now no longer brewed as such. Colours can be used to indicate the different types, dating back to the days when bottles were unlabelled and had to be identified by the capsule or bottle-top alone. Chimay beer labels are based on the colour system (in increasing order of strength red, white and blue). Westvleteren beers are still unlabelled. There is also a number system (6,8 and 10, as used by Rochefort), which gives an indication of strength, but is not necessarily an exact alcohol by volume (ABV). Achel combine a strength and a colour (of the beer itself—blond or brown) designation. The idea of visiting Trappist monasteries to sample their beers has become more popular in recent years, partly due to promotion by enthusiasts such as the ‘beer hunter’ Michael Jackson. Most brewing monasteries maintain a visitor’s centre where their beers can be tasted and bought (sometimes with other monastic products such as bread and cheese). Visits to the monastery itself are usually not available to the general public. Although you can overnight in some of the monasteries (like Achel), if your purpose is non-touristic.